My student teacher, Laurie Anderson, helped her students make paper mache sculptures. 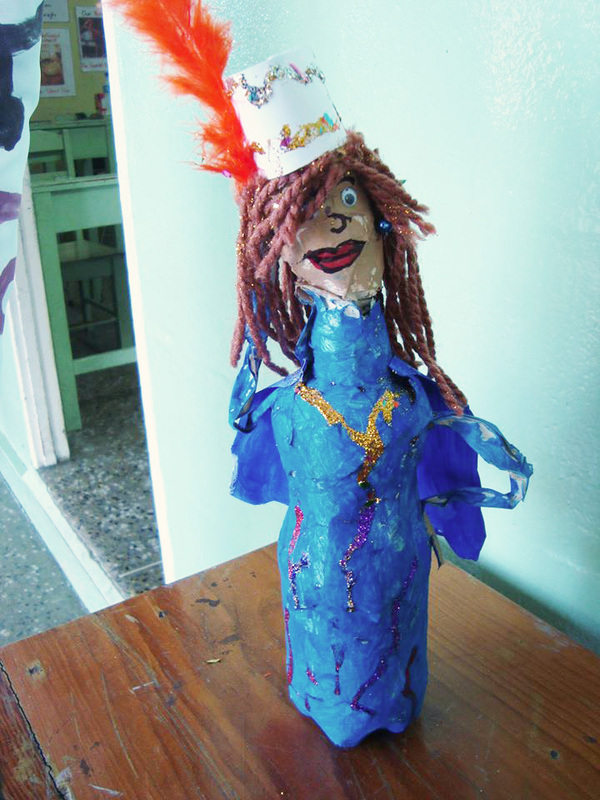 Second graders used water bottles with sand in them (to give stability) They added heads made of crumpled newspaper with masking tape. 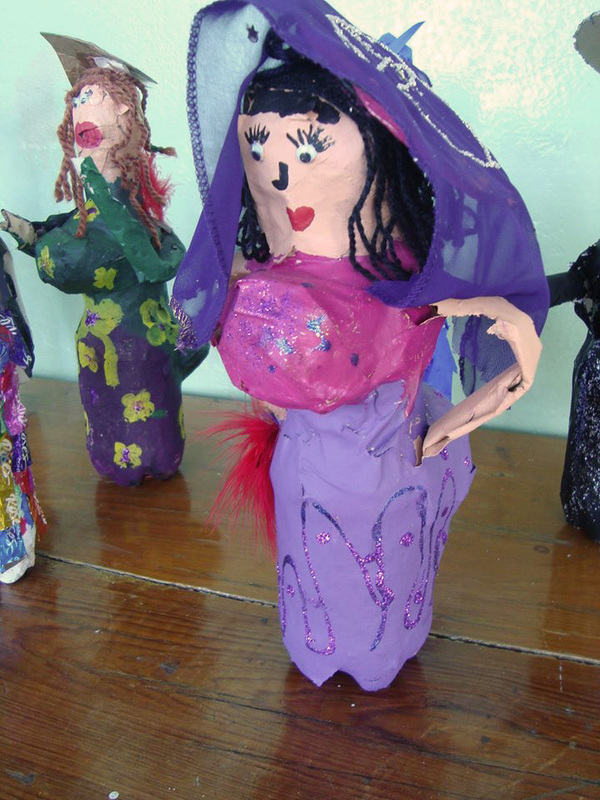 They papier mache'd the entire figure and made them into people, or in some cases animals. 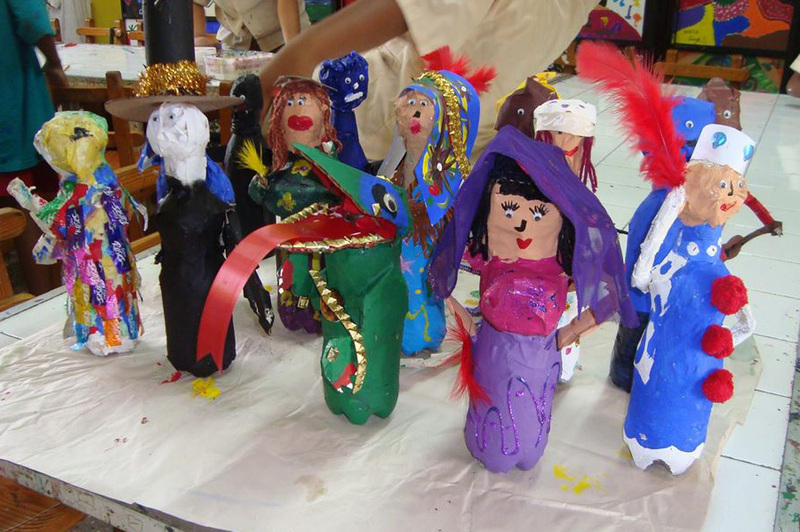 For most students: week one, building armature and papier mache-ing, week two painting with tempera paint and week three dressing the people with cloth, beads, yarn etc etc. Some children chose to continue week four, more of the same. 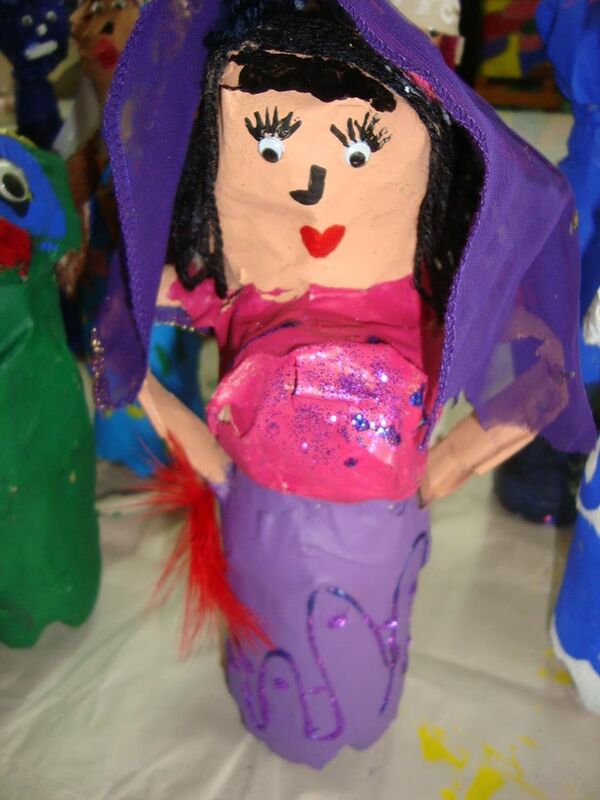 It is the easiest and most open ended papier mache we have experienced in our school. Our friend Carolyn Bonomi shared the idea with us. I usually use the Pariscraft plaster now instead of papier mache as it is faster and dries quickly, although it is much more expensive. I have very little storage space and the plaster sculptures stack without damage. 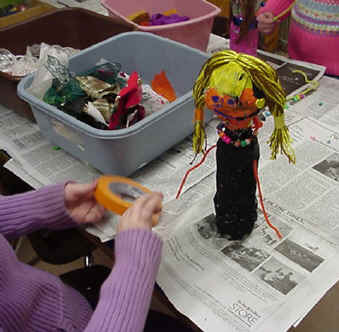 See how TAB Choice Art Ed works - Sculpture center. Right above:"Best Friends"
Yarn Assortment , Beads , fabric, buttons , laces, Sequins, etc. Collect assorted water bottles/pop bottles (16 to 24 oz. size / .47 to .71 liter). Fill with sand to weight them down. Make tennis ball size ball of newspaper for head. Tape to secure form. Tape onto bottle. Ball can be covered with Aluminum Foil to smooth it out. Apply two layers of paper mache. Tear newspapers into approximately 2" pieces. One more layer can be added of torn white newsprint to give a better surface for painting. Paint with acrylics or tempera. 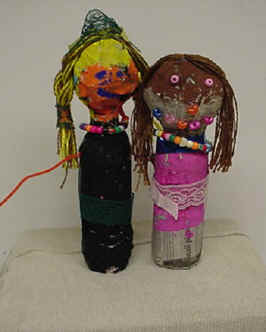 Three examples of the bottle sculptures I did with my first graders. I think that this project would be excellent for high school students. I think I was a bit ambitious for first graders - as far as quality goes - but they had fun. 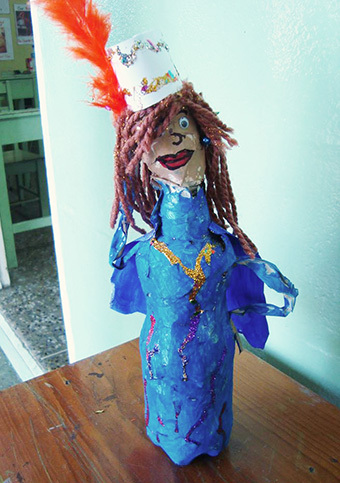 High school students could create 3D features with Celluclay Instant Papier Maché , or add stuffed arms and legs, fabric clothing... really go nuts. These were never really "finished" - they don't have arms, hands or feet - but the art show was looming around the corner - we had to move on. I had my students sketch 3 ideas first, then they picked their favorite one to create 3D. I have a page I made on the computer for them to sketch ideas. 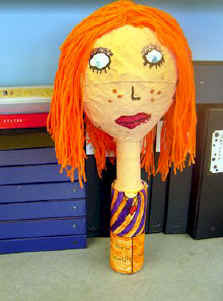 The body is a water bottle filled with sand, the head is a paper mached balloon. A paper towel rolls inside the head - and is hot glued to the bottle - for support (although it could probably be cut shorter - the neck looks too long). Note from Judy: bodies could be large cans. Cut off both ends and push to make oval. Cut a piece of cardboard for the shoulders - tape in place and paper mache. 16 oz cans could be used for necks. I do "Bottle Babies", I call them, because the armature is a two liter bottle for the body. 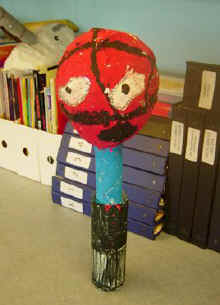 The head is a Styrofoam ball covered with tissues soaked in art paste (Ross or Pritt). 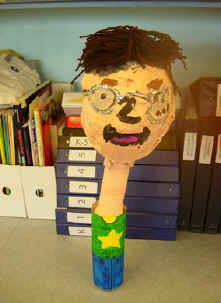 This medium is easily pliable and the kids can form the features (works like a clay). Or, if your budget allows, use Model Magic over Styrofoam ball. (student can also make their own ball shape with newspapers and smooth with aluminum foil) Assign each student a president (or students select their own Hero) and have them create a likeness. They will need a picture and references about their president. Put one layer of papier mache over the body and paint with tempera. Have them add arms and hands, simply from Construction Paper (Wire may be used for arms - padded with paper and paper mached). 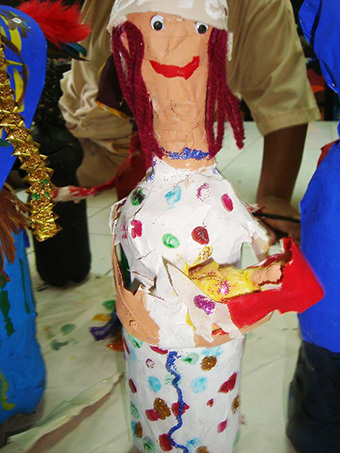 After they have painted the body, I give the kids material and Felt to embellish the clothing. I give them that "real hair" stuff you get in the craft store, or glue on yarn. Then, they make "props" to go with their "Bottle Baby". The props would be something that distinguishes each president/person/hero. 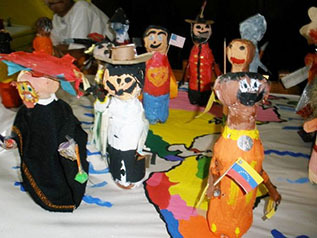 I actually do this project with 2nd graders when they learn how to write biographies in their classrooms. 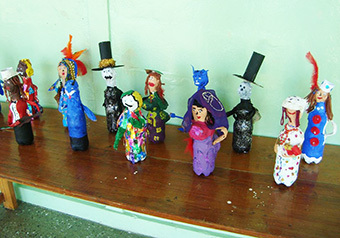 Each student has a famous person to create as a bottle sculpture. 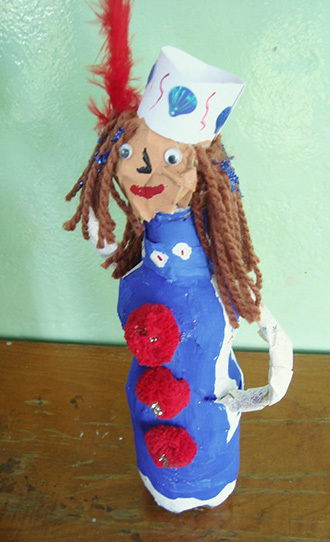 The idea can easily be adapted for a president sculpture, and much easier to execute at the fifth grade level. The kids LOVE this lesson. Susan called them "Bottle Babies" - they were favorite famous people in history who made a difference (heroes). 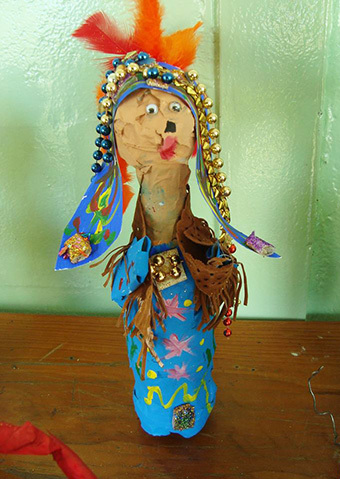 Last year she had the kids do them using (covering) a coffee can as the body. They made soft sculpture faces and covered foil as armatures for arms and legs, which she hot glue onto the can. They came out even better than using the 2 liter soda bottles and Styrofoam heads. They called them "Uncanny Characters"!